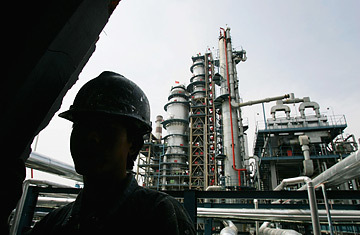 An employee works at the Yanlian Oil Refinery, China. You've heard the reasons for high oil prices: instability in the Middle East, booming demand in China and India, the sagging dollar. Now add another one to the list: Engineers. The world doesn't have enough of them. From Alberta to Azerbaijan, the fervent hunt for new reserves of oil and natural gas is running up against a shortage of experienced oil patch professionals. "We anticipate a 10 to 15% shortfall" in the number of veteran engineers and project managers needed to lead the search for new energy supplies, says Candida Scott, director of cost research at Cambridge Energy Research Associates. This comes as no surprise to people inside the industry. Membership in the Society of Petroleum Engineers has been graying for most of the past decade. Two-thirds of the membership is over 40. More than half of all oil-field professionals will reach retirement age during the next decade, according to CERA's calculations. Meanwhile, the low oil prices of the 1990s turned many petroleum engineering schools into near ghost towns. With prices at near record highs, projects to extract hard-to-reach oil and gas are suddenly viable. But only if there are engineers and scientists to design the deep-water platforms, conduct the advanced seismology, route the new pipelines and so on. Complex projects take longer to build and put a premium on experience  at precisely the time that veteran managers and engineers are passing from the ranks. American companies are responding to the shortage by opening design shops in Southeast Asia, where engineering graduates are more plentiful (though often inexperienced). Still, according to CERA's calculations, the supply of oil-and-gas professionals is stretched to the limit and can't keep pace with the long list of ambitious new projects planned for the next five years. The brainpower shortage means these projects will cost more and take longer to complete, thus contributing to the high price of energy  great news if you happen to be an aspiring engineer. By graduation day last spring at the Colorado School of Mines, every student completing a petroleum engineering degree had already found a job  and most had their pick of competing offers. Starting salaries for undergraduate degree-holders range from $70,000 to $85,000, according to several sources, while engineers with graduate degrees command six figures. The average salary and benefits package for experienced oil professionals in the U.S. is over $160,000, a survey of SPE members recently found. Last year alone, average salaries rose more than 8%. "Starting salaries for recent petroleum engineering graduates are the highest of any engineering profession," says Mark Rubin, executive director of the SPE, which has programs to encourage students as young as grade school to set their sights on the energy business. "In addition to the high pay," Rubin continued, "the work is exciting and high-tech  the oil and gas industry uses more computing power and data than any other industry except the military. An engineer sitting in a control room in Houston can steer a drill bit from a platform off the coast of Africa into an area the size of an average bedroom." The University of Wyoming, which shut down its undergraduate program in petroleum engineering in 1997 due to lack of interest, revived the program last year. And colleges are clamoring for teaching staff: the Colorado School of Mines website, for example, is advertising for petroleum engineering professors at every level, from first-year assistants to candidates for endowed chairs. But a shortage years in the making will not be cured overnight. Scott estimates that a young engineer needs eight years of experience to prepare for a lead role on a major project  even more to master deep-sea drilling. New mentoring programs are being developed to try to speed up the seasoning process, but that won't solve a problem that is right here, right now. Says Scott, "A problem the industry has known about for years is coming home to roost."